The purging of Grammy Award winner Donnie McClurkin from performing at a concert commemorating the 50th anniversary of the 1963 civil rights March on Washington and Dr. Martin Luther King Jr.'s "I Have a Dream" speech should serve as yet another wakeup call to Christian black Americans. McClurkin, a black pastor and gospel music superstar, was asked to step down from his featured performance by Washington Mayor Vincent Gray as result of pressure from homosexual activists. McClurkin preaches against the homosexual lifestyle from his pulpit and says he himself departed and was saved from this lifestyle through God's mercy. Political correctness and a militant campaign to delegitimize religion and traditional values in America have become more important than our constitutionally guaranteed rights to freedom of speech and religion. Let's recall that earlier this year, the Rev. Louie Giglio of Atlanta, selected by President Barack Obama to give the benediction at his inaugural, was asked to step aside when it was found that over a decade ago he gave a sermon decrying homosexual behavior and lifestyle. Anyone who thinks this is a good thing, or thinks it doesn't matter, simply doesn't care or get what a free country is about. When King spoke on the National Mall 50 years ago, he said he came to cash in on behalf of black Americans the "promissory note" guaranteeing the "riches of freedom and the security of justice" transmitted in the U.S. Constitution and the Declaration of Independence. The Constitution's First Amendment guarantees freedom of speech and freedom of religion. What kind of outrage is it that blacks should be willing to accept, in a ceremony commemorating a signature event in civil rights history, that we witness both abrogation of freedom of speech and freedom of religion? We live in a free country. Those who don't wish to read the Christian Bible are not forced to. Those who don't wish to live as Christians are not forced to. But it is quite another thing when traditional Christian values are used as the reason to blacklist a pastor, particularly from an event commemorating black civil rights. 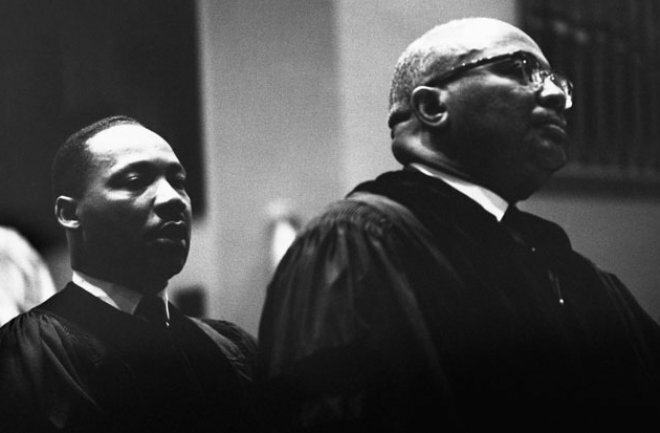 Let's be aware of the concerted effort on the left to purge from memory that Dr. King was a Christian pastor, inspired by the truth of the gospel, who led an organization called the Southern Christian Leadership Conference. No reference is made at all to King's Christianity at the new memorial to him on the national mall. I would argue that it is these very efforts to purge Christian values and replace them with political power that has limited the success and achievement of the civil rights movement. It is the collapse of black family life, the escalation of crime and disease -- much tied to irresponsible sexual behavior -- that has occurred over the 50 years since the March on Washington that has been so deleterious to black progress. The civil rights movement was a Christian movement. It is high time that the black pastor, rather than the black politician, return to leadership in black American life. It is time for the Bible, rather than political answers, to define black life. In a poll done by Zogby International earlier this year, commissioned by BET founder Robert Johnson, 28 percent of blacks agreed and 55 percent disagreed that gay rights are the same thing as rights for African-Americans. Yet homosexuals have hijacked the civil rights movement. And in doing so, they have interjected the very values that are destroying black communities. Let's take back our movement. Rebuild black families by restoring the centrality of traditional Christian values to black life. Only support politicians who sign onto this agenda. And give black parents the choice to get their kids out of public schools and send them to church schools.